One of my favorite parts of being a blogger is being able to highlight Filipino culture. The last few month's I've been able to experience a few up and coming Filipino fusion food spots around San Diego. Filipino Food and Bakery in Barrio Logan. 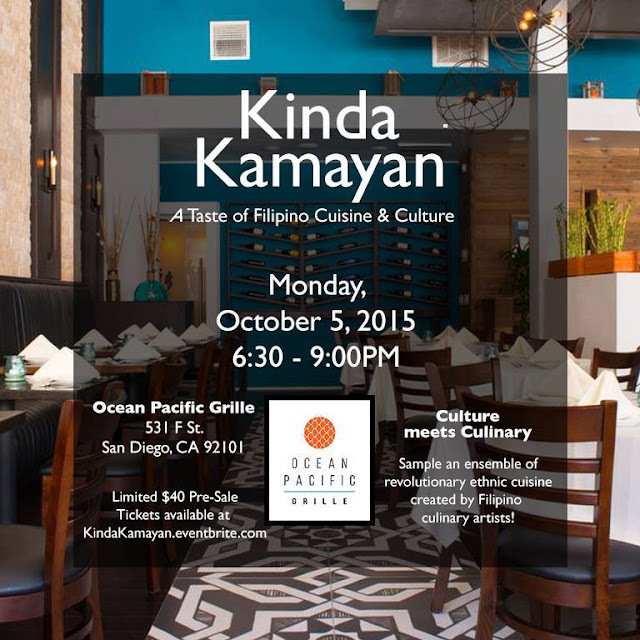 I'm delighted to be a part of Kinda Kamayan is an original and immersive tasting experience that features unique, bold Filipino-fusion cuisine of leading San Diego chefs. I've shared the Filipino word "kamayan" in a previous post. To eat in the "kamayan" style of the Philippines is to use your "kamay" which means hands in the Filipino language. The traditional way of eating in the Philippines is with the hands, especially dishes that are "inihaw" (grilled) or "prito" (fried). When eating, one would take rice pressed together with his fingers and pick up pieces of the main dish. Large banana leaves are used in place of plates. For me, kamayan is not only a means of getting the food from the table to your mouth, but also an experience in feeling the different textures of the food and using my hands in blending flavors of the different dishes to make the meal so much more delicious. Discounted pre-sale tickets can be purchased at the Kinda Kamayan Eventbrite Page. Come and taste what Kinda Kamayan is all about!